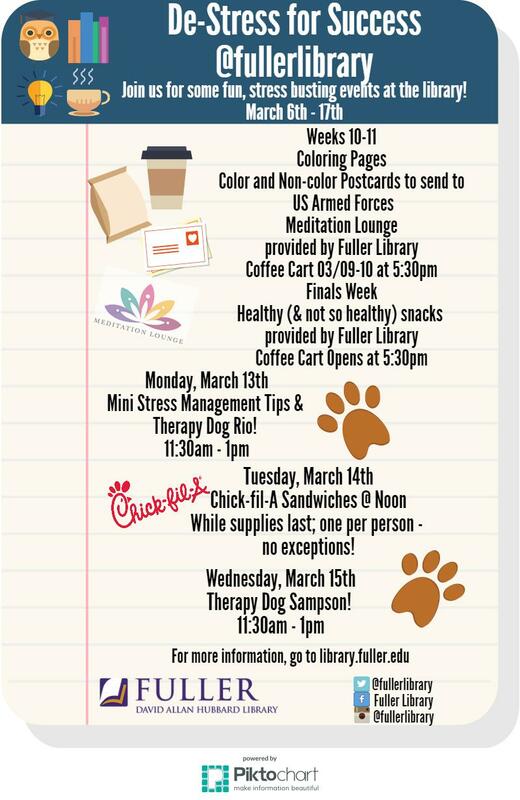 De-Stress for Success at the Fuller Library! Therapy Dog Today! Fuller Library > News > Event > De-Stress for Success at the Fuller Library! Therapy Dog Today! Fuller Library is excited to have our very first De-Stress for Success event during finals week! Check out our schedule below! Meditation Lounge – pillows and pillows, and more pillows! Coloring Pages – give your mind a rest by coloring intricate designs. Postcards (includes color your own) – color and fill one out to thank our U.S. Military! Free Lunch for Fuller student and faculty! Chips, water, and Chick-Fil-A sandwiches for the first 50 people. Starts at Noon in the Library Lobby. Tickets will be handed out for those 50 people – no extra tickets per person. One per person – no exceptions. Not available for visitors / guests. Special thanks to Chick-Fil-A Pasadena for their donation! The winner will be announced on Thursday!! Click here to vote in the semi-finals!